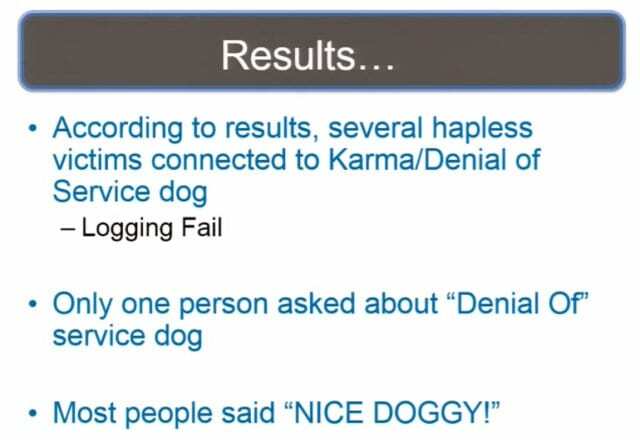 Gene Bransfield moves on to describe further experiments with weaponizing pets, now covering the deployment of the Denial of Service Dog project. Now I’ll move on to the Denial of Service Dog. 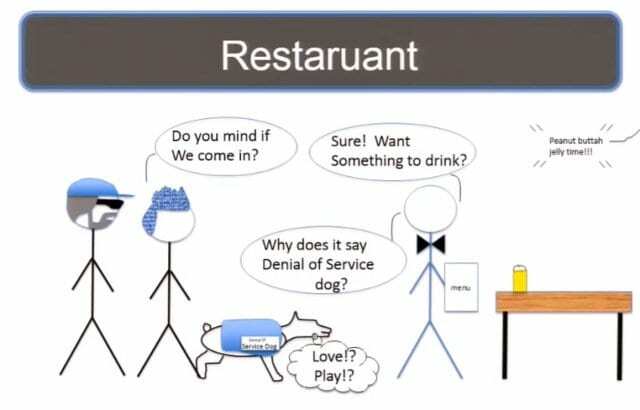 So, the Denial of Service Dog, admittedly, is just trolling. There’s nothing socially redeeming about it all. I got a WiFi Pineapple that I bought at ShmooCon. 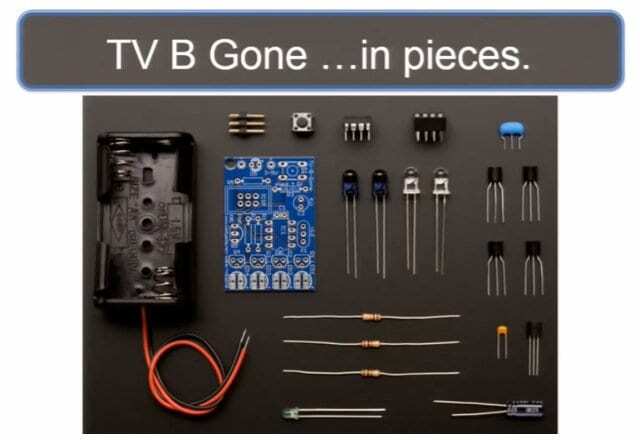 I got a TV-B-Gone that I bought at RadioShack; it’s the Adafruit kit. I also got a doggie backpack with “Denial of Service Dog” patches on it. 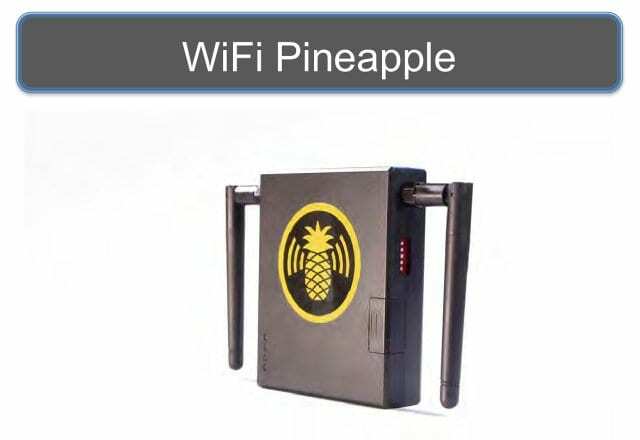 There’s the WiFi Pineapple – you know what that is (see leftmost image below). 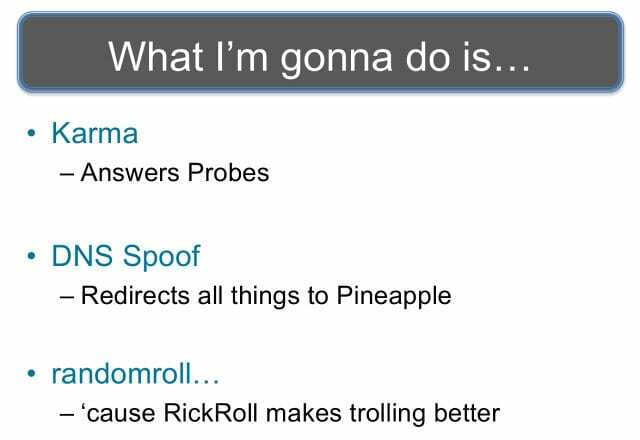 I had Karma up answering probes (see middle image below); DNS Spoof to redirect everything to the Pineapple; and then there’s a package that you can download on the Pineapple called RandomRoll, and it just has, like, 5 or 6 RickRolls that it just cycles through as people connect to it – it’s awesome! 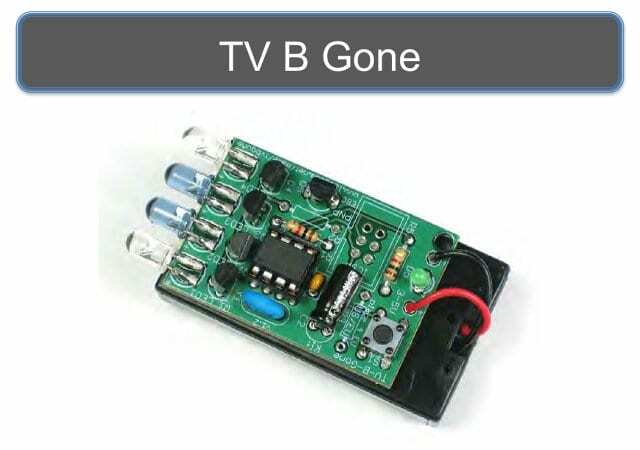 So, here’s the TV-B-Gone as it comes with my newfound soldering skills (see rightmost image above). 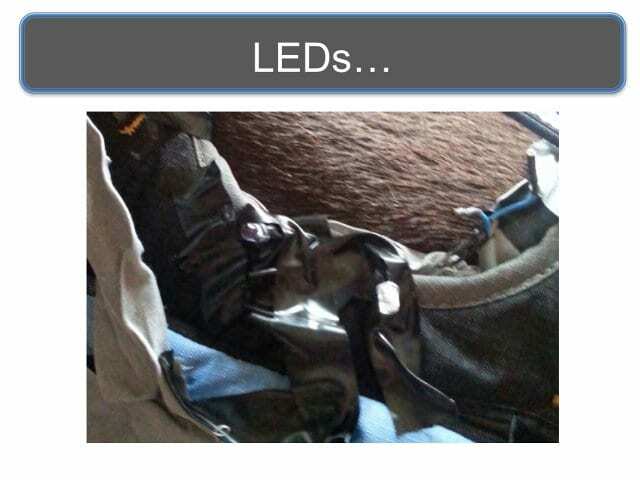 It was supposed to be this (see leftmost image below), and I turned it into this (middle image below), the idea being I was going to get the saddlebag, put the TV-B-Gone in the saddlebag and connect the wires and run them up through so that the LEDs are on the outside of the saddlebag. So, now I need some patches (see rightmost image above). And wholly crap! How hard it is to get somebody making patches these days – nobody does it anymore except on the Internet. 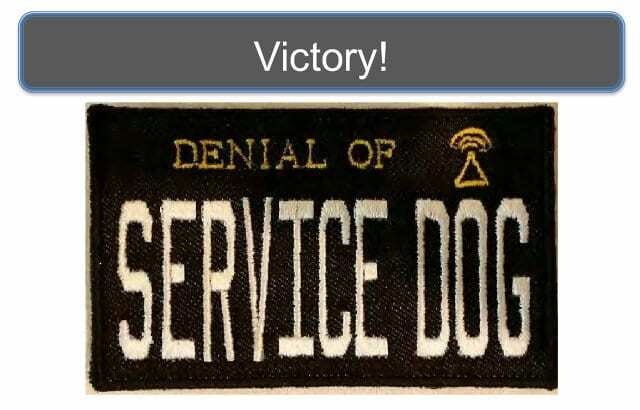 So I beat the streaks for quite a while, and thank God I found Irina & Friends at JoAnn’s Fabrics in Sterling, Virginia, and they made me a Denial of Service Dog patch (see right-hand image). I like the little WiFi thing right there. I have a video demonstration to prove that it works (watch video below). You see there’s the Denial of Service Dog stuff, and the Adafruit stuff all wired up, and there’s the LED sticking outside of the saddlebags. I ran the wire up the leash, and I have that button in my hand right there. I used a lacrosse tape to tie the wire on the leash. The idea is you hit the button right there, you see the little green light start flashing on the Adafruit kit, and then the TV will just turn off. Here’s the demonstration video of this stuff working (watch demo below). I’m outside somewhere, and you will see that the Denial of Service Dog SSID is up, because that was another thing that I did. 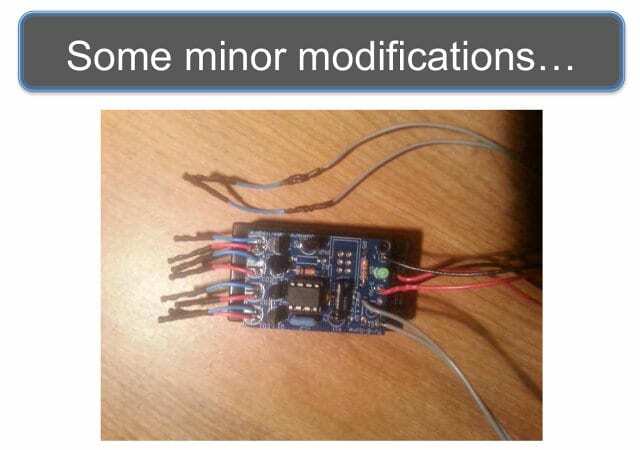 I’m going to add a WiFi hotspot, it’s going to be called “defcon”. I’m filming with one hand and typing with the other; forgive me how long it took to do this. Trying to connect, and Karma is going to go: “Oh, that’s me over here,” so it’s going to pop up, I’m going to connect, and then I’m going to go out to the Internet. I’m now going to go to CNN. So, that’s how that thing works. Now I need a volunteer dog to be our Denial of Service Dog. 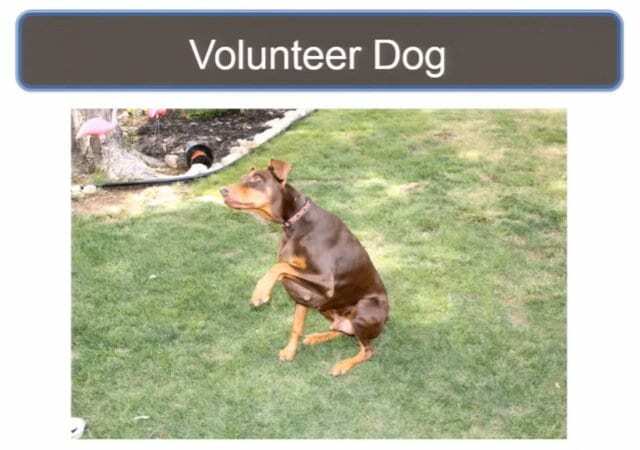 And you notice that this volunteer dog (see right-hand image) is a Doberman pinscher. Have you ever seen a Doberman pinscher service dog? No? Well, now you have. 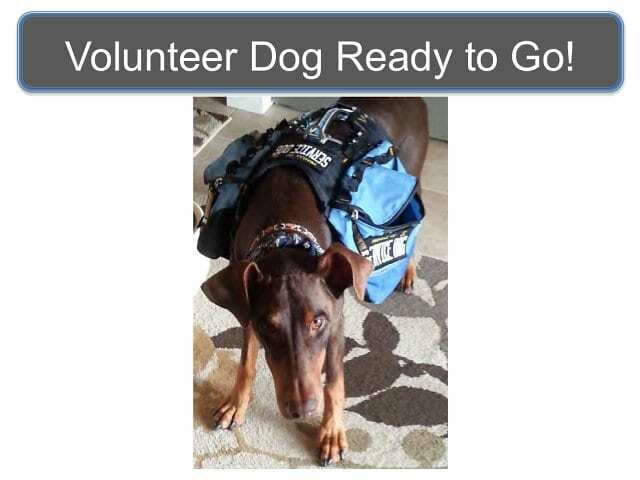 So, our volunteer dog is quite possibly the most anti-Doberman Doberman. When I got there, he just loves everybody, and he ran around the yard for 10 minutes: “Oh my God, so happy – new people, new people, new people!” So we dragged him inside the house and put the backpack on him, and he stood like this for 10 minutes (see leftmost image below). 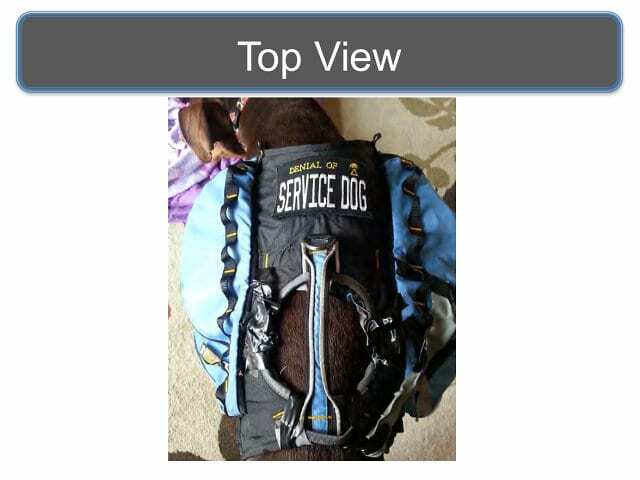 And that’s good because it let me take pictures; there are all the service dog patches on here (see middle image below), and he got that good on there too (see rightmost image below). So, the first thing that the V-dog did when he stopped being comatose is he shook the gear. And we discovered two things. 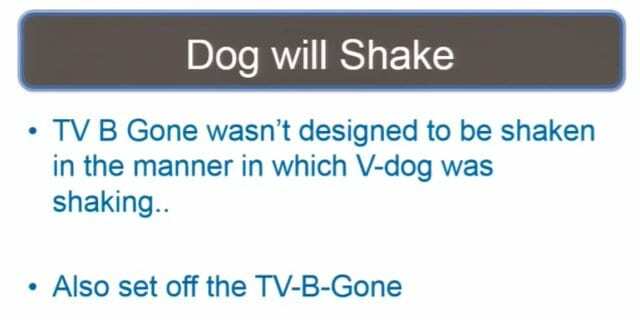 One – there’re now two ways to deploy the TV-B-Gone once you hit the button; the other is the dog shakes. The other thing I discovered is that I failed to properly secure the TV-B-Gone into the patch, and every time he did that it went flying all over the place, and in the process of doing so completely destroyed my TV-B-Gone to the point that even with my newfound soldering prowess I was not able to bring it back. The funny thing is, if it says “service dog” on your dog’s backpack, they will let you in. 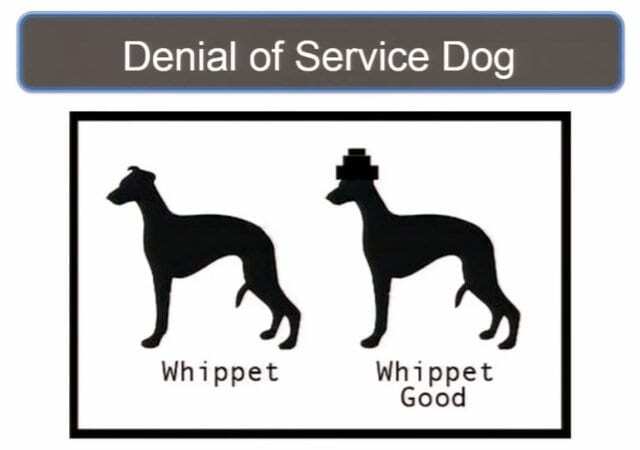 Mine very clearly said “Denial of Service Dog”, and they went: “Service dog? Oh yeah, sure!” Here’s the part where I tell you that one man’s video proof to Defcon is another man’s evidence in court. 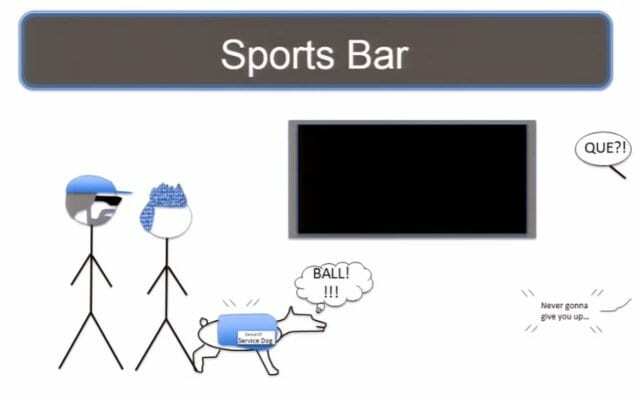 But the truth of the matter is I was so focused on what was going on with the Denial of Service Dog that I hit the wrong button on the GoPro. It’s got two buttons, I hit the wrong one. 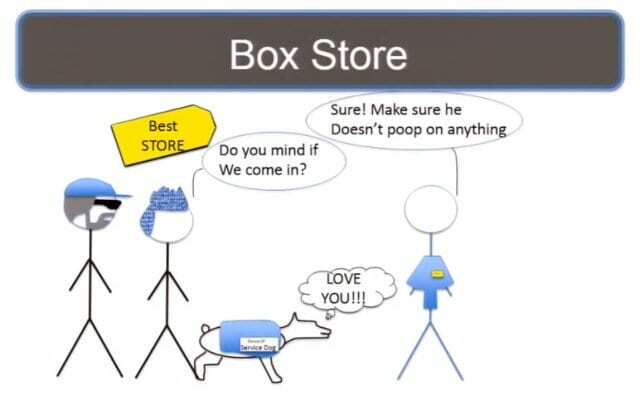 So, now I’ll have to go all xkcd on you here. So, there we are with the V-dog, he’s like: “Oh, I love you, play with me,” I say: “Do you mind if we come in?” Everywhere we went we asked if it was okay to come in, and the guy is like: “Sure! Want something to drink?” And then off in the corner you hear: “Peanut buttah jelly time! Peanut buttah jelly time!” (see right-hand image) I’m taking some artistic license here, but still… So, about the third or fourth time the guy came back to our table, he’s like: “Hey, why does it say Denial of Service Dog?” Props to this guy because he’s the only one all day long that ever asked. But we didn’t answer him and he just went away.